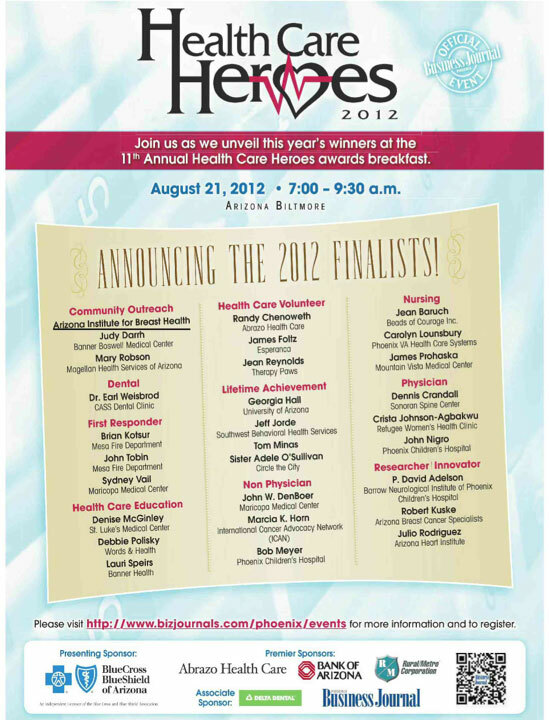 The Phoenix Business Journal's Health Care Heroes Awards have announced the finalists for 2012. We are proud to announce that our very own Dr. Robert Kuske is honored in the Researcher/Innovator category. The Arizona Institute for Breast Health, www.aibh.org, a local non-profit organization that offers a second opinion on treatment options, is also honored in the Community Outreach category. Dr. Kuske sits on the Medical Board of this organization and donates his time every week to provide his expertise on treatment options to women diagnosed with breast cancer. We are very excited to take part in 11th Annual Awards Breakfast on August 21, 2012, as the Phoenix Business Journal unveils this year's winners. Good luck to Dr. Kuske and AIBH! Click on the link below to see the complete list of finalists in all categories.